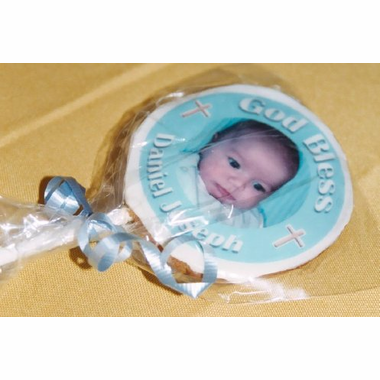 These photo cookie "pops" Christening favors are sure to be a hit with everyone! 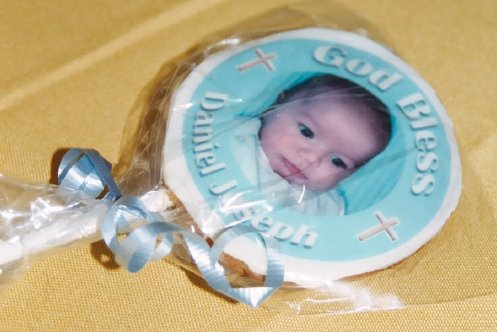 Each fresh baked cookie is iced and an edible image is placed on top of the white icing. Cookies are sold by the dozen and cost $4.67 each. They measure 3.5 inches and the image measures 3 inches. They are individually wrapped in cello bags with ribbon. Sticks are 8." Choose from fresh baked sugar, chocolate chip, oatmeal raisin, M & M, and chocolate white chip. Shipping weight is 5 pounds per dozen. 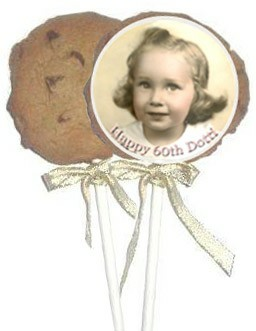 Customers have placed these cookies in a vase so they can also be used for centerpieces.